A wax positive is made. Wax surfaces are smoother and more uniform. More details can be included and less final machining of parts is required. Wall thicknesses are more uniform. Then, the wax positive is covered in ceramic beads. Then the wax and ceramic are heated, the wax melts out and the ceramic fuses into a reverse image of the final part. From this ceramic mold, metal is poured. After it sets, the ceramic jacket is broken off and you get your casting. There is less porosity and less rough surfaces for corrosion to start and many more benefits. ANSI pump parts up to 44 pounds provided by Steel Toe Group (STG) are investment cast. Here is how this benefits you. 1. 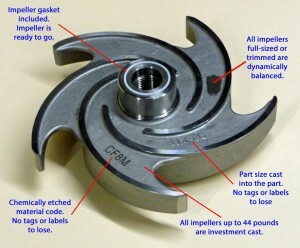 Smoother surfaces on casings and impellers mean lower energy costs. Instead of a rough sand-cast surface creating turbulence which robs energy and causes destructive cavitation, the flow is smoother (laminar). 2. Investment casting insures more uniform wall thicknesses which lead to parts that won’t leak on startup or prematurely. 3. Castings closer to the final size mean less machining, less metal to buy and less metal to scrap. This helps keeps prices down. It takes is some hefty mold costs up front but everything is done for the long-term. Remember the W.O.R.M drives where you would Write-Once-Read-Many Times? Call this P.O.E.M. for Pay-Once-Enjoy-Many Times.